High gloss paint, due to its slick surface, does not accept paint well without proper surface preparation. To do this, you do not need to strip the paint entirely, but it is important to make certain that the paint has no remaining gloss. Removing a paint's gloss will allow a top layer of paint to adhere, whether latex or oil base. 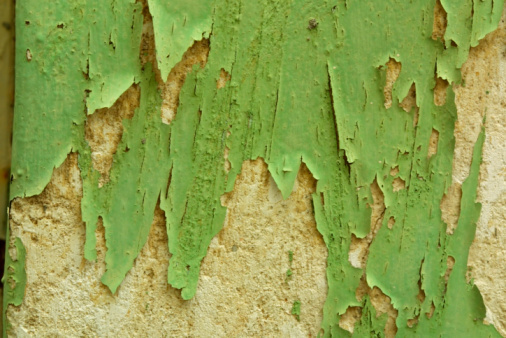 Paint will peel if the glossy base coat is not properly prepared. All-purpose self-priming paint is available at home stores and is formulated to skip the step of priming surfaces to be painted. When painting over gloss enamel, choose a self-priming paint that is of high quality to prevent possible future problems with peeling. Applying primer such as Kilz over the gloss enamel before applying the paint improves the adhesion of the top coat of paint to the surface. The primer effectively bites into the surface that is to be painted. Additionally, primer allows you to use a more varied group of house paints than are available using self-priming paints. Numerous types of primer are available, so be certain to use a primer that is formulated to work with enamel paint. Sanding the surface is the most effective, foolproof way to prepare a glossy enamel surface for paint. Use a palm sander fitted with 120-grit sandpaper to scuff the gloss prior to paint. The minuscule scratches in the surface give the top coat of paint something to grip, preventing it from peeling off the once-glossy enamel surface. Liquid deglosser works in the same way that sandpaper does, but it is a much quicker, dust-free process. Apply the deglosser to the enamel paint, and then follow the package directions for removing the deglosser and then painting the surface. Different manufacturers have different requirements for the chemical's use.